...and beyond that, the "Hotel Beale" sign was also oriented to that same intersection. That photo was taken looking west on Front, so US 66 traffic continued to the left on 4th, but straight ahead was the beginning of US 93-466. 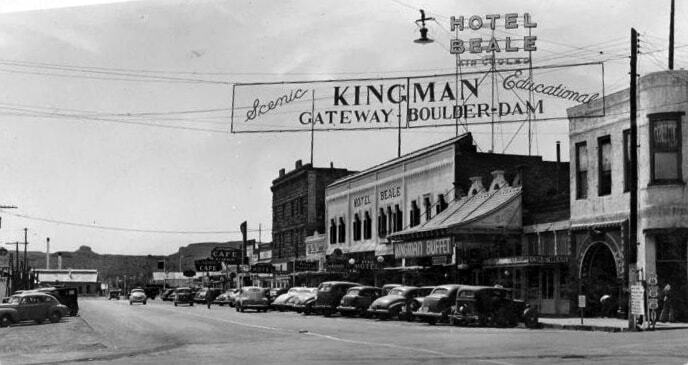 ​Apparently that arrangement lasted for only a few years, because sometime around 1940, US 66 was changed to follow Front all the way through town before angling south on the road that parallels modern-day I-40. 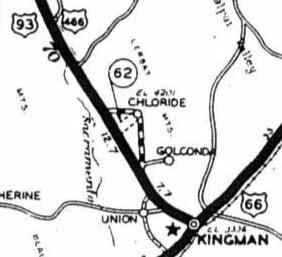 In other words, US 66 began using about five blocks of what had previously been US 93-466, so those designations were truncated accordingly. 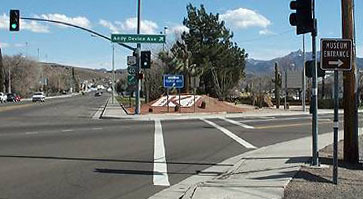 The cross street is Andy Devine, or the "later" alignment of Route 66. 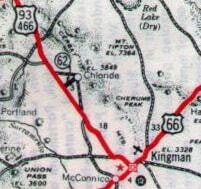 US 93-466 may have ended here for a few years, but by 1965 the US 93 designation was extended further south from Kingman, and then in 1969 AZDoT eliminated the US 466 designation in their state.